Gluten sensitivity, the immunological reaction to gluten leading to inflammatory damage to the small intestine, is a growing concern. The reason for this is threefold. First, the availability of more accurate diagnostic tests has grown.Secondly, our social awareness of this condition has grown. 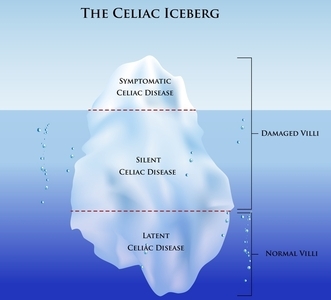 Thirdly, people are learning that the majority of cases of Celiac Disease are undiagnosed because they do not manifest clinical symptoms, at least not initially. It is estimated that about two thirds of Celiac Disease cases fall in this category and go on undiagnosed for a long time. This however does not mean that there is no tissue damage, particularly damage to the absorptive inner lining of the small intestine. Just as in symptomatic Celiac Disease, there is constant inflammatory damage. The difference is that this damage is not severe enough to cause symptoms in the initial stages. However over a prolonged period of time the damage usually becomes significant enough to cause symptoms. Another concern in both symptomatic and asymptomatic Celiac Disease is that there is increased risk of developing intestinal cancer, both the adenocarcinoma and lymphoma types. These cancers form due to the cellular damage incurred by the constant inflammatory state. Thus, it makes utmost sense to be aware of any symptoms of Celiac Disease to catch it at an early stage, to take diagnostic steps to verify these suspicions if they exist, and make proper dietary changes to stop further damage and begin the healing process. Predisposition to Celiac Disease is both genetic (inherited) and environmental. Depending on the strength of the genetic component and the environmental factors, an individual at risk may or may not develop symptomatic disease; however, she may remain in the asymptomatic range for a long time or may not develop the immunological reaction at all. The possible environmental factors are viral gastrointestinal infection in childhood (like rotavirus and adenovirus) and the exposure of gliadin- (or other proalamin-) containing foods before the age of 6 months. At such early age, the intestinal lining is not fully developed and the blood exposure to prolamins is increased, leading to a stronger risk of developing the disease later in life (which can happen at any time). To lower the risk even further, it is recommended to not expose the baby to prolamin/gluten containing foods until the baby reaches one year of age. What actually happens in Celiac Disease (from a physiological point of view) is the reaction of an enzyme called tissue transglutaminase with gluten proteins called prolamins. In wheat, the protein is called gliadin and in barley it’s hordein. In rye it’s secalin, in corn it’s zein, and in oats it’s avenin. Although sensitivity to oats is only reported in a very small proportion of cases. The strongest reaction occurs with gliadin in wheat. Basically the enzyme called tissue tranglutaminaase attaches to gliadin and modifies the protein such that the immune system reacts to it as if it was a foreign and potentially dangerous molecule. A particular region of the gliadin protein also makes the absorptive cells of the small intestine become more permeable. This allows larger protein molecules to pass through before becoming digested and broken down before absorption. This also applies to the gliadin protein as well as the other prolamins. After absorption into the body, the prolamins are exposed to blood and thus to the immune system. The inflammatory reaction is propagated by T cells and immunological molecules such as interlukin 15. The consequence is damage to the intestinal lining leading to malabsorption, foul smelling pale stool, diarrhea, bloating, abdominal pain and flatulence. The symptoms are very similar to Irritable Bowel Syndrome and thus in both cases the person exhibiting these symptoms should be tested for Celiac Disease. Celiac Disease is very similar in nature to autoimmune diseases or to allergic reactions. It’s actually more similar to an allergic reaction in that the immune system reacts to a substance in our environment, particularly to gluten consumed in food. The inflammatory reaction and the damage to the intestine resembles more an autoimmune reaction where the immune system causes damage to an organ, in this case the small intestine. Perhaps this is why celiac disease has a strong association with other autoimmune diseases such as diabetes type 1, immunoglobulin type A deficiency (leading to increased predisposition to infections) and dermatitis herpetiformis (a skin reaction). Other possible manifestations are infertility, unexplained miscarriages, small spleen (again leading to increased risk of infections) and abnormal liver function tests. The symptoms of Celiac malabsorption depend on which nutritional compounds are most deficient. Deficiency in vitamin A causes visual problems (especially decreased night time vision). Low vitamin D and calcium lead to osteoporosis and bone pains due to release of calcium from bone. Vitamin E deficiency can lead to neurological manifestations. Low vitamin K leads to an increased tendency for spontaneous bleeding. Folate and vitamin B12 deficiency lead to megaloblastic anemia and in the case of B12, also neurological symptoms. Low iron causes general anemia and the malabsorption of proteins and carbohydrates leads to excessive weight loss, flatulence, malodorous stool and bloating. Lactose intolerance may also develop leading to abdominal pain, bloating and flatulence when consuming milk products. Thus, is it paramount to perform diagnostic tests for Deliac Disease if one experiences any of the symptoms mentioned above. This is especially true if you consume wheat-containing food products on a regular basis. The first test is a blood test testing for specific antibodies. These are anti-endomysial antibodies (of IgA type) and anti-tissue-transgulaminase antibodies. These tests are very sensitive. Positive results (or even negative, coupled with high suspicion of the disease based on symptoms alone) are followed by a tissue biopsy with an endoscope (usually used under short acting anesthesia and introduced through the mouth). This last test is a little uncomfortable, but is necessary as any blood test alone is associated with some degree of possible error. The ultimate and the only effective treatment is a gluten-free, and thus mainly wheat-free, diet. However, other grains containing prolamins which I mentioned above also have to be avoided. In the majority of cases, oats are ok as well as rice (white, brown and wild), maize, millet, teff, quinoa, buckwheat, sorghum and amaranth. It usually takes about 6six weeks on a gluten-free diet to heal the intestinal lining. Supplementation with the nutrient compounds most likely to be deficient (see list above) is highly recommended at this time. In my future blogs on this subject this month, I will expand on the connection between Celiac Disease and other autoimmune diseases, and also how to implement a proper supplementation plan along with a gluten-free diet in order to fix the possible deficiencies, and contribute optimally to the healing of the intestines and thus the body as a whole. Categories: Digestive Health, Gluten-Free | Tags: colon health, enzymes, gluten free | Permalink.